A woman with a white veil over her head stood with her face pressed against the entryway of the Church of the Holy Sepulchre. 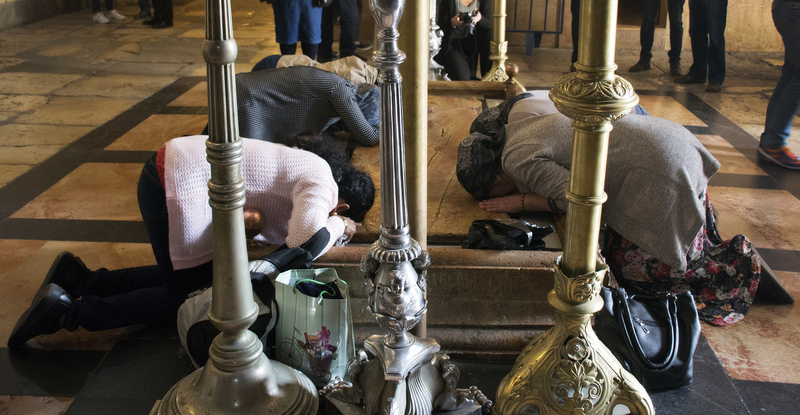 Just inside the doorway, worshippers knelt facedown on the Stone of Anointing, which, according to tradition, is where the body of Jesus was prepared for burial. Throughout the entire church, the enormity of the events said to have happened here more than two thousand years ago was reflected in the reverential awe of the faithful. In countries like Spain and France, many churches and cathedrals are much grander and more beautiful than the Church of the Holy Sepulchre. Its outer walls have no adornment, and the immense size of the building is not immediately apparent since it’s buried amid in the cobblestone streets of Old Jerusalem. Inside, there are no Renaissance paintings, sculptures or murals. The fanciest adornments are the lanterns hanging in the doorway. Yet the other churches, as beautiful as they are, cannot claim to be the place where Christianity began. The stark, uneven walls of the Holy Sepulchre are said to be built on the site where Jesus was buried and resurrected after being crucified on Cavalry Hill nearby. The religious significance of the Holy Sepulchre transcends the divisions in the Christian church, at least in the moment. Every day, Roman Catholics, Greek Orthodox and members of Protestant denominations come together to pray at one of the most sacred sites in Christendom. On a Sunday morning in early March, a diverse group of visitors stood side by side, waiting for their moment to see Christ’s Tomb, where they believe Jesus was buried before he rose from the dead. From the many different arched recesses surrounding the tomb, monks and other groups of religious men emerged, swinging incense and chanting before disappearing back down one of the many hallways. Instead of a large congregational area, services and ceremonies were performed in different corners of the church. In one small chapel, a group of Italian tourists gathered for a Mass in their own language. Although the priest officially celebrated the Mass, the real leader was a little old Italian lady who led the singing as loudly and as long as she wanted. The sound of their voices, unaccompanied by instruments, reverberated through the chapel. For centuries, divisions among Christians were so bitter that a Muslim family, the Nusaybah Clan, who was considered neutral in the skirmishes, was given ownership of the keys to the church. But at this Sunday Mass, the tears, the bended knees, the radiant smiles shared by the worshippers bound them in their awe of the miracle that they believe took place on the ground beneath their feet.